#1. This week's number one is an international forward Omari Gudul (206-94, agency: Two Points, college: Angelo St., currently plays in Bulgaria). He contributed to a 2-point Levski Lukoil's victory against the closely-ranked Rilski (16-7) 75-73 in the Bulgarian NBL last Wednesday. Gudul recorded 7 points in only 14 minutes on the court. It was the game of the round between two top 4 ranked teams. Levski Lukoil Sofia (17-9) is placed second in the NBL. It was his team's seventh consecutive victory in a row. They will play only one more game in the Regular Season. And that game will be critical. Gudul has relatively good stats this year: 10.7ppg, 4.8rpg, 2FGP: 58.7%(27-46) and FT: 76.9% in six games he played so far. He is currently a member of the DR Congolese senior national team. #2. Second place goes to an international forward Eric Kibi (198-90, college: Abil.Christian, currently plays in Spain). Kibi contributed to an easy victory against one of league's weakest teams Agustinos-Leclerc (10-20) 85-67 in the Spanish LEB Silver (third division) last Saturday. He scored 10 points and grabbed 7 rebounds. C.B. Torrons Vicens L'Hospitalet (12-4) is placed third in the LEB Silver. There are only three games left until the end of the Regular Season. So now every game is very crucial. It's Kibi's first season with the team. This year Kibi averages: 4.8ppg, 3.5rpg, 2FGP: 44.1%, 3FGP: 44.4% and FT: 49.2%. He has a dual citizenship: DR Congolese and Canadian. Kibi is in the roster of the DR Congolese senior national team. #3. The DR Congolese player who performed third best last week abroad was an international center Herve Kabasele (208-96, currently plays in Spain). He managed to help Cafes Candelas Breogan Lugo in a victory against the eighth-ranked Leyma Basquet (15-17) 93-86 in the Spanish LEB Gold (second division) on Friday night. Kabasele scored 5 points in 11 minutes. Cafes Candelas Breogan Lugo (27-6) is placed first in the LEB Gold. It was his team's fifth consecutive victory in a row. They will play only one more game in the Regular Season. And now that game is quite important. This year Kabasele averages only 1.3ppg in 12 games. He is also a member of the DR Congolese senior national team. #4. Center Gullit Mukendi (203-96, currently plays in Spain). He could not help Rosalia (11-18) to beat Chantada (20-9). Mukendi cannot count Saturday's game as one of the best ones. He recorded only 2 points in 15 minutes. The 12th-placed Rosalia (11-18) was badly defeated 79-60 on the road by the much higher-ranked (#3) Chantada in the Group A-B. Mukendi's team will play only one more game in the Regular Season. And now that game is extremely important. This year Mukendi has relatively solid stats: 13.4ppg and 3.7rpg in seven games. He is also DR Congolese national team player. #1. Christian Eyenga (201-SF-89, currently plays in Spain) could not help Baloncesto Fuenlabrada (15-14) in their last game. Despite his very good performance Baloncesto Fuenlabrada lost 75-83 on the road to the lower-ranked (#10) CB Canarias. Eyenga was the top scorer with 19 points in 34 minutes. It was Baloncesto Fuenlabrada's sixth consecutive loss in a row. Eyenga has relatively good stats this year: 12.0ppg, 4.4rpg and 1.6apg in 29 games he played so far. #2. 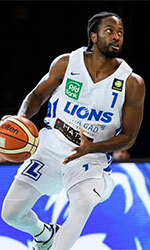 Moses Ehambe (198-G/F-86, agency: Octagon Europe, college: ORU, currently plays in France) was not able to help Le Portel (12-15) in their last game on Tuesday. Despite his good performance Le Portel was defeated 83-75 on the opponent's court by the lower-ranked Chalons-Reims (#14). Ehambe scored 12 points and added 3 assists. Ehambe has relatively good stats this season: 12.5ppg, 1.5rpg, 1.5apg and 1.5spg. He is a naturalized American. Strangely Ehambe has never played in DR Congo. #3. Kevin Tumba (206-C/F-91, currently plays in Spain) managed to help Universidad Catolica de Murcia CB in a victory against the 16th-ranked Zaragoza (8-21) 84-73 in the Spanish Liga Endesa on Sunday night. He scored only 4 points and grabbed 6 rebounds in 19 minutes. Universidad Catolica de Murcia CB (16-13) is placed eighth in the Liga Endesa. This year Tumba averages: 3.6ppg and 5.5rpg in 29 games. He has a dual citizenship: DR Congolese and Belgian. #4. Experienced Yannick Bokolo (191-SG-85, currently plays in France) contributed to Pau-Lacq-Orthez's victory against the 11th-ranked Gravelines-Dunkerque (14-15) 86-81 in the French ProA in Tuesday night's game. Bokolo scored only 4 points and added 4 assists. Elan Bearnais Pau-Lacq-Orthez (16-13) is placed fifth in the ProA. It was his team's fourth consecutive victory in a row. It's Bokolo's fourth season with the team. This year he averages: 2.7ppg, 2.0rpg and 2.2apg. Bokolo is another player who holds two passports: DR Congolese and French. #5. Wen Boss Mukubu (198-F-83, college: UAB, currently plays in Belgium) was not able to secure a victory for one of league's weakest teams Limburg United (13-15) in their game against Belfius Mons-Hainaut (14-14) in the Belgian Euromillions League. Mukubu recorded 9 points (made all of his six free throws). But Limburg United was defeated 87-83 in Jemappes by the higher-ranked Belfius Mons-Hainaut (#5). This season Mukubu averages: 8.0ppg, 3.4rpg and 2.1apg. He has both DR Congolese and Belgian nationalities. #6. Brice Massamba (208-F/C-88, college: UNLV, currently plays in Sweden) couldn't help BC Lulea in their game against Sodertalje Kings in the Swedish Basketligan. Massamba recorded 5 points in 7 minutes. His team was edged 91-89. This year Massamba averages: 3.2ppg and 1.7rpg in 29 games. He also holds two passports: DR Congolese and Swedish. #7. Joseph Vita Sadi (198-F-97, currently plays in Italy) contributed to Fabriano's victory against the 12th-ranked Nardo 93-85 in the Italian Serie B (third division) in Sunday night's game. Vita Sadi scored 5 points. Vita Sadi's overall stats this season are: 3.2ppg and 3.1rpg.